(AP) WASHINGTON (AP) — The CIA station chief opened the locked box containing the sensitive equipment he used from his home in Tel Aviv, Israel, to communicate with CIA headquarters in Virginia, only to find that someone had tampered with it. He sent word to his superiors about the break-in. In a separate episode, according to another two former U.S. officials, a CIA officer in Israel came home to find the food in the refrigerator had been rearranged. 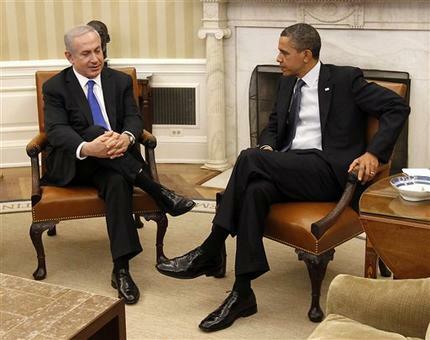 In all the cases, the U.S. government believes Israel’s security services were responsible. The CIA considers Israel its No. 1 counterintelligence threat in the agency’s Near East Division, the group that oversees spying across the Middle East, according to current and former officials. Counterintelligence is the art of protecting national secrets from spies. This means the CIA believes that U.S. national secrets are safer from other Middle Eastern governments than from Israel. The counterintelligence worries continue even as the U.S. relationship with Israel features close cooperation on intelligence programs that reportedly included the Stuxnet computer virus that attacked computers in Iran’s main nuclear enrichment facilities. While the alliance is central to the U.S. approach in the Middle East, there is room for intense disagreement, especially in the diplomatic turmoil over Iran’s nuclear ambitions. U.S. political praise has reached a crescendo ahead of Republican presidential candidate Mitt Romney’s scheduled meeting Sunday with Israeli Prime Minister Benjamin Netanyahu in Jerusalem. Their relationship spans decades, since their brief overlap in the 1970s at the Boston Consulting Group. Both worked as advisers for the firm early in their careers before Romney co-founded his own private-equity firm. Romney said in a speech this past week that Israel was “one of our fondest friends,” and he criticized Obama for what he called the administration’s “shabby treatment” of the Jewish state. “The people of Israel deserve better than what they’ve received from the leader of the free world,” Romney said in a plain appeal to U.S. Jewish and pro-Israel evangelical voters. Matthew Aid, the author of “The Secret Sentry,” about the NSA, said the U.S. started spying on Israel even before the state was created in 1948. Aid said the U.S. had a station on Cyprus dedicated to spying on Israel until 1974. Today, teams of Hebrew linguists are stationed at Fort Meade, Md., at the NSA, listening to intercepts of Israeli communications, he said. Israel is not America’s closest ally, at least when it comes to whom Washington trusts with the most sensitive national security information. That distinction belongs to a group of nations known informally as the “Five Eyes.” Under that umbrella, the United States, Britain, Australia, Canada and New Zealand agree to share intelligence and not to spy on one another. Often, U.S. intelligence officers work directly alongside counterparts from these countries to handle highly classified information not shared with anyone else. Israel is part of a second-tier relationship known by another informal name, “Friends on Friends.” It comes from the phrase “Friends don’t spy on friends,” and the arrangement dates back decades. But Israel’s foreign intelligence service, the Mossad, and its FBI equivalent, the Shin Bet, both considered among the best in the world, have been suspected of recruiting U.S. officials and trying to steal American secrets. Around 2004 or 2005, the CIA fired two female officers for having unreported contact with Israelis. One of the women acknowledged during a polygraph exam that she had been in a relationship with an Israeli who worked in the Foreign Ministry, a former U.S. official said. The CIA learned the Israeli introduced the woman to his “uncle.” That person worked for Shin Bet. During the Bush administration, the CIA ranked some of the world’s intelligence agencies in order of their willingness to help in the U.S.-led fight against terrorism. One former U.S. intelligence official who saw the completed list said Israel, which hadn’t been directly targeted in attacks by al-Qaida, fell below Libya, which recently had agreed to abandon its nuclear weapons program. The espionage incidents have done little to slow the billions of dollars in money and weapons from the United States to Israel. Since Pollard’s arrest, Israel has received more than $60 billion in U.S. aid, mostly in the form of military assistance, according to the Congressional Research Service. The U.S. has supplied Israel with Patriot missiles, helped pay for an anti-missile defense program and provided sensitive radar equipment to track Iranian missile threats. Just on Friday, Obama said he was releasing an additional $70 million in military aid, a previously announced move that appeared timed to upstage Romney’s trip, and he spoke of America’s “unshakable commitment to Israel.” The money will go to help Israel expand production of a short-range rocket defense system. Some CIA officials still bristle over the disappearance of a Syrian scientist who during the Bush administration was the CIA’s only spy inside Syria’s military program to develop chemical and biological weapons. The scientist was providing the agency with extraordinary information about pathogens used in the program, former U.S. officials said about the previously unknown intelligence operation. At the time, there was pressure to share information about weapons of mass destruction, and the CIA provided its intelligence to Israel. A former official with direct knowledge of the case said details about Syria’s program were published in the media. Although the CIA never formally concluded that Israel was responsible, CIA officials complained to Israel about their belief that Israelis were leaking the information to pressure Syria to abandon the program. The Syrians pieced together who had access to the sensitive information and eventually identified the scientist as a traitor.